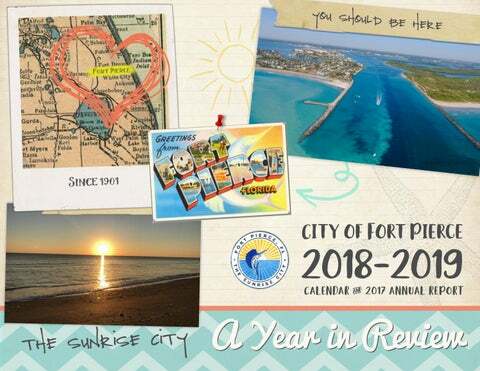 CITY MANAGERâ&#x20AC;&#x2122;S MESSAGE It gives me great pleasure to present the 2017 Annual Report and 2018 Calendar for the beautiful City of Fort Pierce. 2017 was an excellent year for the City of Fort Pierce and it can be seen and felt in the optimism and the positive energy of our citizens, businesses, and visitors. Fort Pierce is the historic gem of the Treasure Coast and we are experiencing safer neighborhoods, bustling parks, new business development, explosive growth in tourism, and educational institutions that are among the best in the region. The City of Fort Pierce shall continue to implement improvements for our residents, businesses, and visitors with a dedicated mission to provide community leadership, quality public service, and a safe environment for all citizens, by an empowered team of employees motivated by pride in themselves and their work. Listed below is a snippet of accomplishments by this organization which would not have been possible without the spectacular employees that strive each day to provide the excellent customer service that our residents have come to expect. Under the strong leadership of a trailblazing Mayor and four passionate members of the City Commission, the City of Fort Pierce is strong and the future looks even better!!! FORT PIERCE POINTS OF PRIDE Held the 2nd Annual City of Lights Decorating Contest sparking hundreds of residents to light up their property and prompting businesses to decorate for the joyful holiday season. Established a productive partnership with Allegany Franciscan Ministries in an effort to spark economic development, preserve historic structures, and create sustainability in the Lincoln Park area. Coordinated the 2nd Annual Job Fair with Career Source Research Coast engaging over 60 employers to visit the Percy Peek Gymnasium in an effort to assist the underemployed population of our community. Developed the Peacock Arts District which is situated west of US Highway 1, east of 10th Street, and along Orange Avenue that was designed to capitalize on the rich artistic history of the City of Fort Pierce. Hosted another wonderful and successful 3rd Annual Highwaymen Heritage Trail Art Show and Festival. Completed the construction of the Indian Hills Recreation Area in cooperation with St. Lucie County, South Florida Water Management District, and the Florida Department of Environmental Protection. Completed the reconstruction of North 13th Street from Avenue E to Mooreâ&#x20AC;&#x2122;s Creek. Completed the resurfacing of North 17th Street from Avenue I to Avenue D. Created the Fort Pierce Youth Council fostering productive interaction with the strong, diverse, and vibrant population of our community. Held the 1st Annual Unity in Our Community Festival. Coordinated the revival of the Indian Hills Golf Course which has significantly increased the quantity of rounds played at this local recreational amenity. Completed the site rehabilitation of over 7 acres of land in Downtown Fort Pierce that previously housed the electrical power generation plant. The City of Fort Pierce has hosted 3 successful Annual Florida Highwaymen Festivals. The annual tribute to the Highwaymen artists and their contribution to the rich cultural history of Fort Pierce takes place along beautiful Moore’s Creek Linear Park, at the corner of Avenue D and 8th Street every February. The event features many of the ‘Original’ and 2nd Generation Highwaymen artists who display and sell art, tribute booths for several of the deceased artists, live jazz music, food, novelty vendors, and a kid’s zone. More information on this event is available online at https://thehighwaymentrail.com. The new St. Lucie County Bike Share program provides a non-motorized transportation amenity allowing City residents and visitors the opportunity to take short trips around our popular historic downtown, public parks,` and commercial destinations without the use of automobiles. It’s a great way to exercise and experience all the wonderful activities Fort Pierce has to offer. Simple rental charges are available to City residents at $1.00 for the first hour and $2.00 per hour thereafter. Visitors are charged $2.00 for the first hour and $4.00 per hour thereafter. The station bicycles are designed to be lightweight, stable and easy to operate. All bikes have six speeds, front and rear safety lighting, adjustable seats, and courtesy baskets. The bike station rack system is easy to use where locking or accessing bikes is a one step process. Visit http://bike.zagster.com/stlucie/ to learn more. T THE “NEW” COME CHECK OU INDIAN HILLS!! The Indian Hills Golf Course (IHGC) has been the cornerstone of affordable golf in the area since 1942. The 6,555 yard layout offers fantastic greens and generous fairways to accommodate players of all ages and abilities. Built on a sand ridge, the naturally rolling terrain provides elevation changes and a “links style” feel. IHGC hosts several leagues and remains fairly busy throughout the year, but you can always get in a game if you’re by yourself! IHCG pride themselves in the pace of play and remain steadfast in maintaining a “4 Hour Round!” Indian Hills Golf Course carries a variety of golf clubs from Taylor Made, Callaway, Odyssey, and Tour Edge as well as golf balls from Titleist, Callaway, and Bridgestone. Men’s and women’s golf shirts, hats, FootJoy shoes, and souvenir pieces are also in stock. The conveniences of a Practice Range, Putting Green, and Snack Bar along with minor Club Repair and Rental Clubs are available in the event you didn’t travel with your own. With four rates throughout the day, you can tee it up for as little as $20 after 3:00 pm inclusive of a cart and tax! Peacock Arts District "PAD" In October 2017, the City of Fort Pierce officially unveiled the first beautification project in the Peacock Arts District and honored the artists who made it happen. ABOUT THE PAD Located west of US 1, along Orange Avenue, the Peacock Arts District (“PAD”) concept was generated by the community during a public meeting and the area is now being branded with its own unique identity. Many beautification projects are currently underway, including enhanced lighting and street pole banners. POT PAINTING PROGRAM The painted pots project is in partnership with Keep Fort Pierce Beautiful and many local artists. Fifteen terracotta pots were purchased by the City to line Orange Avenue with Southern Red Cedars to infuse color and life into the corridor. To take it one step further, over a dozen local artists painted each pot with vibrant colors that capture the reinvigorated feeling of the district. There was no doubt in our minds the City Marina would hold up despite the unsettling fear of the unknown thanks to the hurricanes of 2004. The new marina was built to withstand such a force as Hurricane Irma, bringing winds upwards of 185 mph. High gusts, white caps and storm surge could be seen beyond the islands creating serious waves and wake as the storm approached. The City was so well prepared for this storm in so many ways. From constant communication from the City Manager’s office to our Public Works, Building, Code Enforcement, and Engineering departments working in overdrive to ensure every detail throughout the city was covered. Every department rallied together to make sure the City was ready to weather the storm. The following weekend and after thorough inspections, Marina Square opened up its traditional Saturday morning Farmers Market. Restaurants and businesses also recovered quickly and opened within days. What a site for sore eyes after being cooped up looking for sunlight and a warm meal. We can be #FortPierceProud as we say on social media; not only did we come together, but we proved we are stronger together. In September 2017, the City Commission approved a resolution adopting a Clean and Safe Community Initiative Fee. The Clean and Safe Community Initiative (CSI) is a program designed to address blight in the community by demolishing derelict buildings and securing structures that are in disrepair but have the chance to be rehabilitated. There is a direct correlation between blight and criminal activity and by removing the conditions that cause blight, it will remove or deter the related criminal activity that accompanies it. A small charge is placed on the utility bill because this new initiative will be funded by residents. For $1.00 per month (12.00 per year) every resident can help make their community a better and safer place for themselves, their children and their family. Keep Fort Pierce Beautiful, which builds and sustains a clean, green and a more beautiful Fort Pierce, hosted its Annual Great American Cleanup on April 1, 2017. All volunteers were assigned to a team to tackle various improvement projects throughout our community. e Apr at Ame il 14 r , 201 ican Cl 8 at e PAL anup: Par k.
The Arbor Day celebration honored the Cityâ&#x20AC;&#x2122;s 28th year of receiving the Tree City USA award. Our team of volunteers, Public Works Department employees, and Natures Keeper Landscaping planted a variety of shrubs, grasses and trees in the right-of-way on Sunrise Blvd. The star of the show, an icon triple stem Silver Date Palm, was planted at the roundabout at Sunrise Blvd. and Ohio Ave. Dale Cassens Educational Complex was an exciting project attracting school students and faculty to work alongside our volunteers to create new vegetable gardens plus a beautiful butterfly garden. Some volunteers also participated in rebuilding and painting eight school benches near the front entrance of the school. Other volunteers painted the Pioneer Park Pergola and South Beach Park and every year, the City runs the trolley for a special project graffiti removal team. The volunteers get a firsthand look at what is involved in removing graffiti throughout the City identified by our Code Enforcement Department. This was a ton of f u n !! St. Lucie Public Schools (SLPS) is ranked fifth overall in Florida and is the highest ranking district on the Treasure Coast with an overall graduation rate of 90.1 percent. According to a report released by the Florida Department of Education (FDOE), all SLPS comprehensive high schools made significant gains and four high schools boast graduation rates that exceed 93 percent (Lincoln Park Academy, 99.6; Treasure Coast High School, 97.3; Fort Pierce Central High School, 95.5; and St. Lucie West Centennial High School, 93.2). Fort Pierce Westwood High School and Port St. Lucie High School far exceeded the State graduation average and improved their graduation rates by 6.7 and 8.4 percent respectively. TOURISM ST. LUCIE COUNTY TOURISM OFFICE EXPERIENCED ITS FOURTH CONSECUTIVE RECORD-BREAKING YEAR IN BED TAX COLLECTION! Expanding Targeted Industries New manufacturing and processing businesses include: Precast Specialties, Radical Cosmetics, and Maverick Boat Group. New / Expanding retail and service businesses include: Sailfish Brewery, WaWa, Causeway Cove Marina, Chick-fil-A, Fly The Whale, Volkswagen, Pierced Cider, and Aldi. It has been a very exciting for the growth of the Port of Fort Pierce. St. Lucie County continues to explore strategic options for the development of the Port in partnership with the City of Fort Pierce. St. Lucie County acquired the former privately-owned Indian River Terminal, along with submerged land leases, and U.S. Army Corp of Engineers permits for expansion. The County will seek proposals for the development and operation of the former Indian River Terminal, with the potential for the complementary development of its 20-acre parcel known as Harbour Pointe. The City is coordinating efforts with the County and the State of Florida for the development of Fishermanâ&#x20AC;&#x2122;s Wharf. TO BE BUILT WITHIN THE NE XT 5 YEARS! The Fort Pierce Police Department hosted their first annual Unity in Our Community Day in July 2017, and it was a huge success! With well over 1,000 children and adults attending, Unity in Our Community was a memorable event. The day was filled with free, empowering resources, health care, bounce houses, rock painting, a photo booth, food, balloon art, face painting, a talent showcase, and a friendly dance off between the Fort Pierce Police Department dance crew and the children in the community. Many worked tirelessly to ensure the event would be successful. COMMUNITY GARDEN Job seekers and Treasure Coast employers packed the Havert L. Fenn Center at the Third Annual City of Fort Pierce Job Fair on January 31, 2018. The City of Fort Pierce, Career Source Research Coast, St. Lucie County Board of County Commissioners, the Economic Development Council of St. Lucie County, and the St. Lucie County Chamber of Commerce were partners in bringing the largest crowd yet! This fair was a â&#x20AC;&#x153;must attendâ&#x20AC;? for those seeking quality jobs in the area. There were over 100 employers and 20 community service providers in attendance. Our primary goal was to promote and increase the job choices available to residents and we believe the event was a major success! Since the Community Garden kicked off again in October 2017, there has been lots of participation from the community, churches, citizens, as well as programs promoting healthy habits in Fort Pierce. The encouragement and promotion of the Community Garden throughout Fort Pierce has been amazing and provides a beautiful landscape for the Lincoln Park area. One seed can produce a world of healthy change and Fort Pierce wants to be the leader in our community to promote it. treats such as, candy canes, hot cocoa and cookies while people waited to board the trolley. Our surprise guests, Mr. and Mrs. Claus, were there to help brighten the night and even made time for pictures before their big journey. The trolley was decorated from the inside out with blinking whites lights, a wreath brightened the outside while garland and jingle bells decorated the inside, inviting everyone to get into the Christmas spirit. The hosts, Shyanne Helms and Joe Sweat, entertained everyone with Christmas trivia, Santa jokes, and of course, Christmas carols; though they didn’t sing alone. One woman said “The trolley ride was like a magical, yet comical Hallmark movie.” It was an exciting time in Fort Pierce during the holiday season and we look forward to new and exciting adventures in 2018. We especially look forward to next year’s trolley tours in hopes that you will join us! On October 30th, hundreds of people gathered downtown to embark on a little adventure to learn about our Fort Pierce history during the City’s first Historic Scavenger Hunt! Each year, the City of Fort Pierce participates in Florida City Government week, a great way for municipal governments to engage its community and residents. The journey began at Marina Square where each participant received a Fort Pierce goodie bag containing their first clue to decipher in order to move on to the next location. Eight locations were specifically selected for their unique contribution to Fort Pierce history. Some of the stops included Old Fort Park, Lincoln Theater, and P.P Cobb General Store. Over 40 City employees volunteered by passing out the next clue and helped guide each team to the next location. The final clue guided everyone upstairs to the Adams / Cobb Museum located in the P.P. Cobb building. The Jazz and Blues Society set the ambiance, doing what they do best, playing snazzy hits. Everyone was treated to hot chocolate and cookies. Special guests such as Allen Balough, author of Black Sails 1715, and of course, our wonderful Mayor Linda Hudson greeted our guests as they made their way up. Participants continued their journey of learning through City memorabilia. The event was a huge success to say the least, and everyone from children to adults had an absolute blast learning so much about our history. The Fort Pierce Youth Council (YOCO) was established by the City of Fort Pierce to help provide a voice and an ear to the youth in our community. It is youth led, under adult guidance, with the assistance and partnership of the St. Lucie County Roundtable. YOCO meets once a month where the youth create new ways to become engaged in the community, plan monthly community projects, but more importantly, become leaders in our city. Everyone had a great time taking selfie’s and showing off their Fort Pierce pride on City Hall Selfie day! It was wonderful to see citizens and visitors stop by to snag a selfie with the Mayor and the City Manager in front of City Hall. Fort Pierce even won an award from the Florida League of Cities for the Most Creative Selfie Day! The City of Fort Pierce is pleased to announce the launch of a new and improved website. 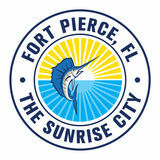 The site, www.cityoffortpierce.com, was built with the user in mind and features improved navigation that will help visitors surf Fort Pierce with greater ease. The new design was created using analytics that place the top-visited pages prominently on the home page. Major upgrades include: a revamped navigation structure allowing users to quickly and easily access the information they’re seeking; a responsive design, optimized for viewing on any device to fit a growing mobile audience; a cleaner design to make it easier to read and find information quickly; embedded social media widgets to stay up to date on the latest posts without signing in; and a heavy focus on photos that showcase beautiful points of interest in Fort Pierce. In December 2017, the City of Fort Pierce debuted its brand new public access talk show called “Sunrise Spotlight.” The Sunrise Spotlight is an informational public access talk show highlighting current happenings, special events, and news in the City of Fort Pierce. The “Sunrise Spotlight” is recorded on the third Thursday of each month at 2:00 PM at SLCTV Studio with a live audience. Thereâ&#x20AC;&#x2122;s always something to do in beautiful Fort Pierce. Check the calendar to see the list of events. Photography by Joe Semkow The Fort Pierce Inlet has been labeled the best â&#x20AC;&#x153;all weather inlet on the east coast.â&#x20AC;? The Inlet and surrounding lagoon provide easy access to the Atlantic, spoil islands, diving / snorkeling, kayaking, and world class fishing. Photography by Donald Rogers Photography Get those lawn chairs ready!! The Stars Over St. Lucie is one amazing fireworks show that you wonâ&#x20AC;&#x2122;t want to miss! The vision of the Peacock Arts District (PAD) is to embrace the arts and culture of Fort Pierce. The beautification began with 15 beautiful hand painted pots and street pole banners featuring the new PAD logo. Each year, CeeCee Ross Lyles, a Fort Pierce native, is honored for her courage during September 11th at the Liberty Garden. Her statue overlooks the beautiful Indian River and is a reminder of her bravery. Photography by Adams Ranch, Inc. Whether you enjoy the salt life or heading out west to get close to nature, Fort Pierce has the best of both worlds. â&#x20AC;&#x153;Along the shore there floats a dock, where fishermen gather and pelicans flock. Come sunrise and sunset the pier is dipped in gold but its after twilight when the real adventures unfold.â&#x20AC;? - Glen Thuncher, photographer. Photography by Bob Bernier Fort Pierce is such a magical place during the holidays. The sights, sounds, and all the wonderful displays, light up this beautiful town. Photography by Ingrid Zagers Take a cruise back in time at the Fort Pierce History Festival on January 12, 2019! BOARDS & COMMITTEES: Arts and Culture Advisory Board will advise the City Commission on matters pertaining to Arts and Culture and Art in Public Places (AIPP) projects and promote outreach and involvement of the community, collaborate with other governmental agencies, volunteer organizations, etc. in the advancement of Arts and Culture planning and programming. This board is now forming and city residency is required. Board of Adjustment meets on the 4th Thursday of the month at 6:00 p.m. The board reviews and votes on variance and special exception applications along with appeals. Members must be a St. Lucie County resident. Board of Examiners of Contractors meets on the 2nd Tuesday of each month at 9:00 a.m. The board provides practical and adequate control of all contractors in the construction trades in the city. Members must be a St. Lucie County resident for at least two years representing specific fields. Civil Service Appeals Board meets as needed to hear employee appeals, conduct investigations, and enforce a code of rules. Members must be St. Lucie County residents and not an employee of the city. Communitywide Council meets on the 2nd Wednesday of each month at 6:00 p.m. The Council reviews the cityâ&#x20AC;&#x2122;s Community Development Block Grant (CDBG) Program Annual Action Plan, economic development business loan applications, non-profit organizations request for funding applications, and proposed projects for recommendations to staff and City Commission. Members must represent specific targeted areas and be a city resident. Construction Board of Adjustments & Appeals meets on the last Tuesday of each month at 9:00 a.m. This board considers decisions of building officials and applications for variance. Members represent specific fields from the construction industry. Community Redevelopment Agency Advisory Committee meets on the 3rd Wednesday of each month at 2:00 p.m. Its function is to study, review, and provide recommendations, guidance, and advice as to matters relevant to the purposes and goals of the Fort Pierce Redevelopment Agency. Members must be a resident within the district boundaries, own a business or be a financial executive of a business within the CRA boundaries. Fort Pierce Authentic Tours Advisory Board meets as needed. This board is an economic development initiative of the city to build capacity and sustainability for local businesses involved or related to the eco/agri/ nature tourism industry. Members must be business owners located within or focused on assets of the City. Fort Pierce Utilities Authority meets on the 1st and 3rd Tuesday of each month at 4:00 p.m. In 1972, the citizens of Fort Pierce voted by referendum to create the Fort Pierce Utilities Authority which oversees utility services provide to city residents. Members must be a qualified elector of the City and have no business relationship with FPUA. Historic Preservation Board meets on the 4th Monday of each month at 6:00 p.m. This board handles many tasks including maintaining historic district boundaries and monitoring the upkeep of the local register of historic sites and districts. Members must be city residents or operate a business in the City. Keep Fort Pierce Beautiful Advisory Board meets on the 2nd Tuesday of each month at 12:00 p.m. along with the Tree Board. The board engages, educates and empowers community members to take greater responsibility for creating a clean and beautiful city through litter abatement, waste reduction, recycling, and community beautification in order to improve health and prosperity of our community. Members must be city residents or own a business in the city. There is one seat dedicated for a St. Lucie County resident. Planning Board meets on the 2nd Tuesday of each month at 6:00 p.m. This board is essential in reviewing and influencing the management of growth in Fort Pierce. Members must be a city resident for at least two years. Police Officers Retirement Fund Board of Trustees meet quarterly. The Board is responsible for administering the trust fund and members must be a city resident. Sunrise Theatre Advisory Board meets on the 2nd Tuesday of each month at 5:30 p.m. at the Sunrise Theatre. This Board serves as a liaison between the community and the Theater. Members must be city residents however there are seats dedicated for St. Lucie County and neighboring county representation.